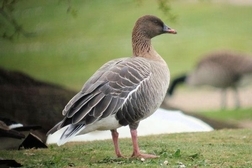 Here on Arran there are three types of "grey geese" that are seen in the winter: the Greylag Goose, the Pink-footed Goose and the White-fronted Goose. 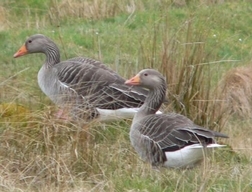 Appearing distantly across a field and mixing together in shuffling herds, the similar "grey geese" of the genus Anser can seem difficult to separate. Features such as bare part colour or shade of grey can be difficult to judge in a misty morning or in the fading winter light, but here are a few features to help you tell them apart. The Greylag is by far the most numerous on the island with flocks of up to five hundred in the Shiskine Valley and at the south-end round Clachaig. On the ground look for the large pinkish-orange bill and dull pinkish legs. In flight the front of the wing is a striking pale ash-grey contrasting with the dark rear parts of the wing. These flocks are worth checking for other "grey geese". The largest group of Pink-footed Goose reported in 2012 was seventy five. Slightly smaller and more compact than the Greylag, the Pink-footed has a small bill typically mostly black with only a pink band across the outer part. The head is rounded and the head and upper neck are dark brown-grey contrasting with the paler lower neck and body. The legs are pink. In flight the dark head and neck contrast with the pale upperwing and back. 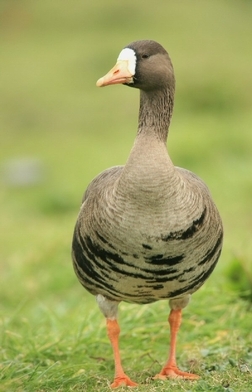 In 2012 there was only one report of White-fronted Goose. It was with the Greylag in Shiskine Valley in January. The adult has a prominent white blaze surrounding the base of the bill and black transverse markings on the belly. These features begin to develop from the end of the first winter. Juvenile birds have a dark tip to the beak. Armed with this information, hopefully you will be more confident about checking the flocks of shy geese that do not tolerate close approach, looking for the interesting individuals hidden by the other geese or vegetation or with their legs and bill stained with mud or simply lying down asleep! Who knows there may even be a Bean Goose or a Lesser White-fronted Goose to be identified!